Background: The use of tablet devices and smartphones in medicine as assessment tools is becoming more widespread. These devices now run mobile applications or “apps” that have traditionally been the domain of desktop computers or more dedicated hardware. It is important that health professionals have confidence in the accuracy of measurements obtained from these new tools. The “EyeSnellen” app for the iPhone/iPad (running Apple Inc’s iOS operating system) allows users to measure visual acuity using a portable Snellen chart installed on a tablet device. Aims: To compare the visual acuity measurements obtained from EyeSnellen iPad app with a standard illuminated Snellen Chart. Methods: Participants were recruited from a tertiary level eye clinic in Western Australia. Visual acuity was measured using the Snellen light box chart and a visual acuity measurement was obtained using EyeSnellen app installed on an Apple iPad mini with the use of an Apple Iphone as a remote that was connected via Bluetooth. Results: 122 eyes were tested. Bland-Altman analysis revealed a mean difference of 0.001 logMAR units between the visual acuity measurements obtained from EyeSnellen app and those taken on the light box chart with 95% limits of agreement of –0.169 to 0.171. Conclusion: The Snellen Chart function on EyeSnellen app is equivalent to the traditional Snellen chart at measuring visual acuity at a test distance of 6 metres. Measurement of visual acuity provides a screening tool for the diagnosis of underlying disease and can be used as a predictor of the functional consequences of visual loss1. It is the first of the “vital signs” of ophthalmology. The original Snellen chart was developed in 1862 by Dr Herman Snellen and since that time many variations have been proposed and considered. Since the advent of Smartphones and tablet devices, ‘apps’ have been used to simplify many existing daily tasks. In medicine there are an increasing number of uses for these devices and apps are now used widely as resources for learning and tools for improving clinical assessment and treatment. Currently there are multiple apps available worldwide for testing visual acuity however few have been standardised and validated for use. The EyeSnellen app was developed by Dr Stephen Colley (www.eyeapps.com.au), a Western Australian Ophthalmologist, and released on the iTunes App store in December 20122. It uses an iPad to display the Snellen chart and an iPhone or iPod as a remote device via Bluetooth. There have been regular updates with new features and the app is currently version 1.6 (as of December 2013). There have been over 9500 downloads as of March 2014. To date, there have been two published studies comparing visual acuity estimates using a standard eye chart and an eye chart on an iPad/tablet device. The first, a study conducted in a Chinese ophthalmic centre, compared an iOS app (Eye Chart Pro) against a tumbling E light box chart3. Their study collected measurements from 240 eyes and concluded that the Eye Chart Pro app was reliable for visual acuity testing when the Snellen visual acuity was better than a decimal visual acuity of 0.1. The second study, conducted in New Zealand, collected visual acuity measurements on patients without ocular pathology4. The study concluded that tablet computer devices were only suitable for use in situations where sources of glare could be eliminated. There has not been a study validating the use of a Snellen chart on a tablet device. The portability of tablet devices also makes them ideal for remote and rural health care settings and for mobile screening units. 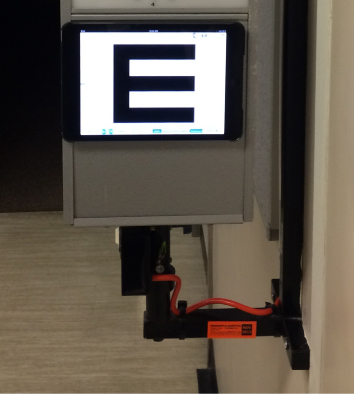 We hypothesized that the EyeSnellen iPad tool was comparable to the traditional Snellen chart at measuring visual acuity at a test distance of 6 metres. The study was approved by the South Metropolitan Health Service Human Research Ethics Committee. All participants provided informed consent before participating in the study. Participants were recruited from presentations to the Fremantle Hospital Eye Clinic over a period of two weeks. Patients were excluded from participating if they were below the age of 16, English was their second language or if their visual acuity was worse than measureable on the Snellen Chart. Visual acuity was assessed using the Snellen Chart function on the EyeSnellen iOS app (ver 1.6) installed on a second generation Apple iPad mini and using a traditional Snellen light box chart. The Snellen Chart function was chosen as it is the most commonly used chart for testing acuity of vision in Western Australian ophthalmology clinics. Visual acuity measurements were assessed and recorded by two resident medical officers. Patients were instructed to stand 6 metres from both charts. A spectacle vision occluder was used to first test the right then left eye of patients. Patients were instructed to read each line until they were no longer able to resolve the optotype. A visual acuity measurement was recorded if the patient was able to read more than half the optotypes of a given line. Visual acuity was first assessed using EyeSnellen app and followed by a measurement using the traditional Snellen Chart. Neither the assessors nor the patients were masked for the outcome of the vision test. The same refractive correction was maintained for measurements with both charts (either unaided, habitual correction or pinholes). Visual acuity measurements were recorded as decimals. Results were then converted to logMAR visual acuity for statistical analysis. R (Ver 3.0.2), a freely available statistical computer package5, was used to calculate the results. A total of 67 participants (average age 57, range 19–89) were recruited for the trial. From these 67 participants, 122 eyes were tested. Main diagnoses were 19 eyes with corneal pathology (16%), glaucoma in 13 eyes (11%), 7 postoperative eyes (6%), cataract in 6 eyes (5%), and 4 eyes with dry eye syndrome (3%). There were 29 eyes (24%) without documented pathology. The median logMAR visual acuity measured using the Snellen Chart function on EyeSnellen app was 0.097. The range measured –0.125 to 1.000, which is equivalent to a decimal range of 0.100 to 1.333. 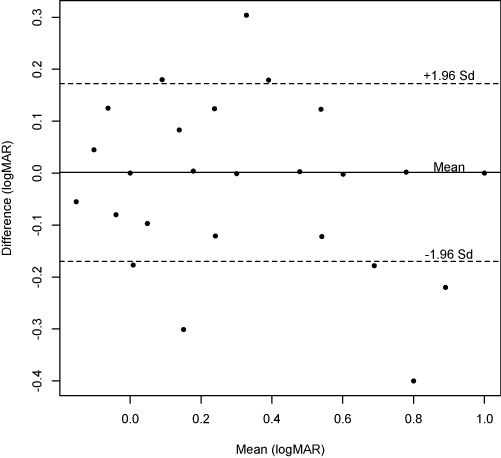 The median logMAR visual acuity measured using the Snellen light box chart was 0.176. The range measured was –0.176 to 1.000, which is equivalent to a decimal range of 0.100 to 1.500. Bland-Altman analysis demonstrated agreement between visual acuity measured by Snellen chart on EyeSnellen and visual acuity measured by the Snellen light box chart. This result demonstrates that EyeSnellen can be used as an alternative to the traditional Snellen light box chart when vision is tested at 6 metres. The large difference in median visual acuity measured between the EyeSnellen app and the Snellen light box chart may be explained by a limitation of the study. The 6/7.5 and the 6/4.5 visual acuity intervals were absent on the Snellen light box chart and the 6/5 and 6/4 intervals were absent on the EyeSnellen app. The calculated median result for EyeSnellen equated to the 6/7.5 interval (which was not a provided interval on the light box chart) whereas the median result calculated for the light box chart was 6/9. Given that 6/7.5 and 6/9 are neighbouring intervals it may be highly likely that eyes assessed to be 6/9 on the light box chart may in fact have tested to be 6/7.5 had the interval been available. A possible source of bias is present due to the lack of masking of the patient or tester, a situation arising from clinic workflow constraints. Our findings differ slightly from recent studies investigating the reliability of visual acuity measurements on a tablet device. Zhang et al concluded that the Eye Chart Pro iOS app is reliable for testing visual acuity when the decimal Snellen visual acuity was better than 0.16. Our results suggest the EyeSnellen iOS app is reliable for all visual acuities measureable on the Snellen Chart. Although we minimised glare by mounting the tablet device vertically, our results suggest an antiglare screen is not necessary which had been suggested by Black et al to obtain accurate visual acuity measurements7. Interestingly, although the illumination of the iPad mini screen was measured at 200 lux (below many recommended national standards8,9) its visual acuity measurements were still comparable to the light chart which had a measured illumination of 600 lux. The difference in illumination between both charts may have influenced visual acuity measurements. A study comparing different chart luminance levels suggests that doubling of the luminance level within a range of 40 to 600 lux improves measurements of visual acuity by approximately one letter on a five letter row10. Some advantages of the EyeSnellen app were noticed during testing. The remote function allowed randomisation of optotypes, which removed the chance of patients recalling optotypes from memory. 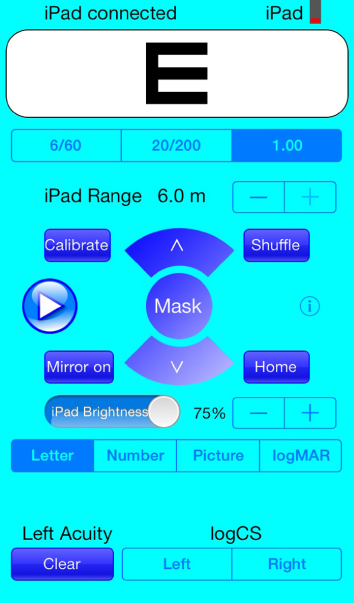 Another advantage of the app allowed assessors to observe the letters and visual acuity interval on the remote, which made the recording of visual acuity easier. The Snellen chart function on EyeSnellen app can be reliably used to measure visual acuity in clinical settings. Furthermore, the application may be more advantageous than traditional light box charts due to its portability and the ability to randomise optotypes. The authors would like to thank the staff and patients of the Fremantle Hospital Ophthalmology Department for their patience and support in conducting this research study. 1. Colenbrander A. The Historical evolution of Visual Acuity Measurement. The Smith-Kettlewell Eye Research Institute. 2001. http://www.ski.org/Colen brander/Images/History_VA_Measuremnt.pdf (Accessed June 2013). 2. Eye Apps website; Stephen Colley, 2013. Available at: http://www.eyeapps.com.au (Accessed March 2014). 3. Zhang ZT, Zhang SC, Huang XG, et al. A pilot trial of the iPad tablet computer as a portable device for visual acuity testing. J Telemed Telecare 2013 Jan;19(1):55–9. 6. Zhang ZT, Zhang SC, Huang XG, et al. A pilot trial of the iPad tablet computer as a portable device for visual acuity testing. J Telemed Telecare 2013 Jan;19(1):55–9. 7. Black JM, Jacobs RJ, Phillips G et al. An assessment of the iPad as a testing platform for distance visual acuity in adults [Internet]. BMJ Open. 2013 [cited 2014 Mar 6];3(6). Available from: BMJ. 8. New Zealand Government. Medical Aspects of fitness to drive. New Zealand Transport Agency, 2009 Jul. 139p. 9. Canadian Medical Assocation. CMA driver’s guide: Determining Medical Fitness to Operate Motor Vehicles, 8th Edition. 2012. 134p. 10. Sheedy JE, Bailey IL, Raasch TW. Visual acuity and chart luminance. Am J Optom Physiol Opt 1984 Sep;61(9):595–600.